There's a venue to book, a wedding party to pick, a certain dress to buy and so many other things that go into planning that one big day. So start a wedding binder/email folder, grab a checklist (The Knot has one, as do other websites like Real Simple and WeddingWire) and take note of these tips for gearing up to say, "I do." Don't look for a dress before you know where you'll be getting married. "It's crucial to match a bride's dress to her venue and overall wedding day aesthetic," Pease said. Experts advise purchasing a dress about eight months before your wedding date, and to plan on having three additional fittings before the big day -- the first at about six weeks out, a second one the month before and a final fitting at one to two weeks before the wedding day. Those are three of the many things that must be decided leading up to a wedding. There's also choosing the bridesmaids and groomsmen, picking an officiant, deciding on invitations, buying wedding bands and so much more. Many checklists divide to-do tasks into when they should be done -- a few months out, a few weeks out, the week before, the day of and so on. For example, hire a photographer/videographer at about eight months before, send invitations three months before and confirm details with vendors one to two weeks before the big day. But whether you've been planning for months or getting hitched more last-minute, there's just one big to-do for after the "I do" -- enjoying life as newlyweds! 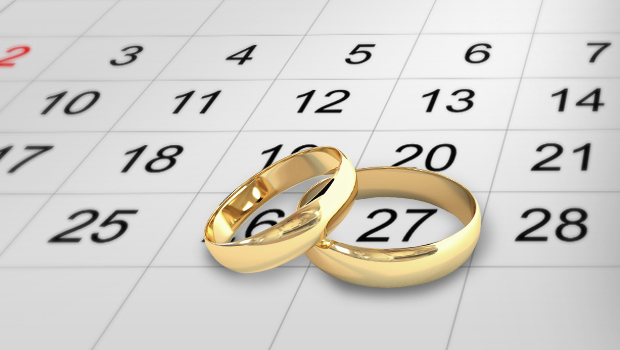 Tell us: How are you planning your big day?